Prolaera | Better training, better professionals. CPE doesn’t have to be a grind. Prolaera is built for the modern CPA. From first-year staff to partners, we have something for you. 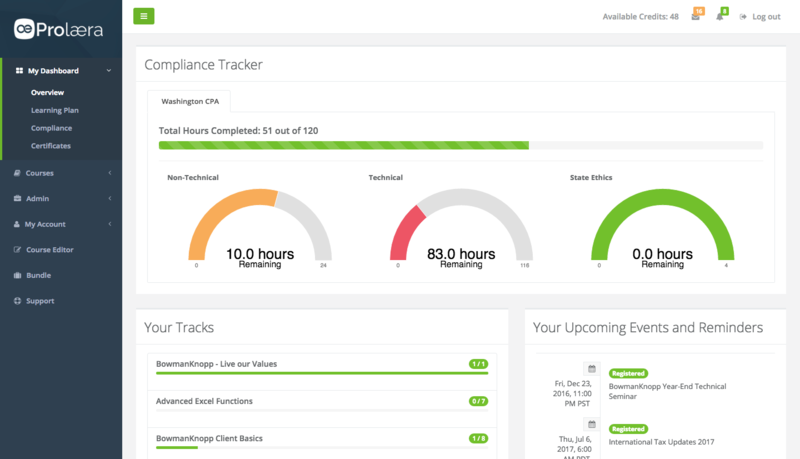 We’ve invested heavily in making tracking your CPE hours quick, easy, and understandable. We’ll monitor your renewal dates, registered events, and any changes to your compliance requirements – and keep you in the loop along the way. All Your Certificates. One Place. It’s a snap to upload your certificates & keep them in one place. We’ll automagically update your CPE hours, back them up for you, and make it easy to create renewal or audit reports – instantly. Find courses from your firm & great teachers to build your perfect learning plan. We’ll help you find the right courses to master new skills & level up. 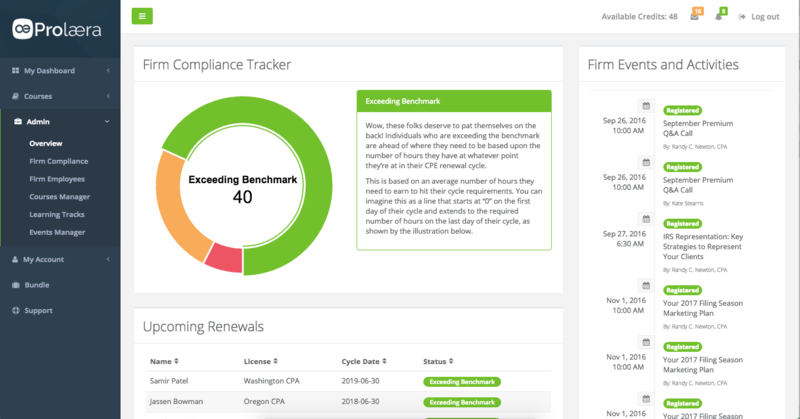 From one simple dashboard you can get a bird’s eye view of your entire firm’s progress. This makes it easy to see how everyone is doing and keep tabs on what you need to act on. Easily assemble courses into learning tracks. With learning tracks, you can lay out a series of courses for your first-year staff to hit the ground running, help an individual Manager master a new skill, & everywhere in between. Quickly add all of your in-house courses and events in Prolaera and select your preferred providers – and now you have your own catalog of learning opportunities for your staff. Assign great courses to your staff and collaboratively build their learning plans. Free up your to-do list for things that really matter. As a firm administrator, you’ve got plenty on your plate to keep things running smoothly. Of course, some of those things produce much more value than others. Prolaera is built to help automate most of the manual work involved with planning, coordinating, and tracking Continuing Professional Education. Prolaera frees up your to-do list to let you focus on what you do best. According to a study by PwC, new employees prioritize learning and development opportunities over any other factor when considering a role. Development opportunities are also tightly linked to employee engagement. Talented employees stay with companies far longer when they’re effectively engaged. You already find and develop training for your staff, but do you try to include your clients in your in-house CPE? Prolaera allows you to easily include your clients, potential clients, and colleagues in CPE programs you develop. Training your clients demonstrates your expertise, builds your brand, and allows them to learn more about the breadth and depth of your services. This helps you keep your clients longer and improve the value of your clients’ accounts by helping them understand how you can better help them. Consistent training, learning, and development allow you to craft your firm’s culture. With a centralized place to develop your employees it’s easier to ensure that everyone is headed in the same direction. Prolaera gives you the tools you need to establish a growth mindset within your firm with more learning opportunities as fuel. With structured training tools in Prolaera, you’ll be able to focus your efforts to extend your lead in key practice areas. Better learning & development programs are a strong signal to potential hires and clients that you’re committed to excellence. After all, your employees are the most valuable asset and maximizing their potential is critical. Ultimately, how your firm is perceived by your clients will be tied to the quality of their work. Better staff will help you attract and retain, more clients. Learning that goes with you and fits neatly into your life. We’ve built Prolaera so it will be with you whenever and wherever you need it. Complete courses, upload certificates, and check your progress with a couple taps. We’re mobile, just like you. It would be silly to need training to use a product you use for training. So we’ve invested heavily to make using Prolaera as easy-to-use and intuitive as possible. We’ll have you setup in minutes. The new nano-learning requirements mean you can earn CPE credit in as little as 10-minutes. Prolaera was built to make the most out of the potential nano-learning unlocks. Great content is essential to effective training. Prolaera makes it easy for anyone to create self-study, webinar, and live courses which meet all of the requirements to qualify for CPE credit. Training and making the most out of your CPE investment is hard. You have plenty of tools at your disposal, but what you need is a solution. Prolaera will help you get there.